Emily had quite a day today. 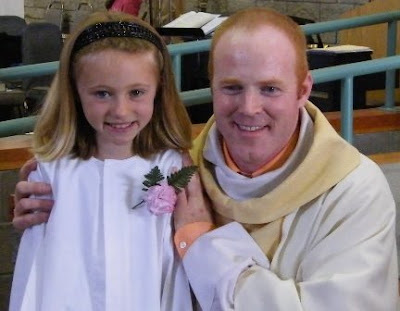 With much help from her parents and the catechism teachers, she's been preparing all year to make her First Holy Communion. So today was the big day and all her aunts, uncles, grandparents and cousins travelled to Moncton, to attend the Mass and to help make her day special. Here she is, posing with the priest. And there was a lovely reception after. I loved this cake. It has all the symbols of our faith. 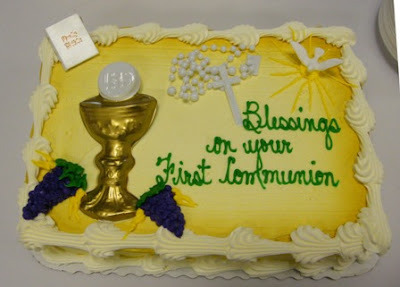 Following the reception, all the family went back to the house and Emily opened First Communion gifts from everyone. What a happy day. At least twice, Emily told me she loved her First Communion dress. 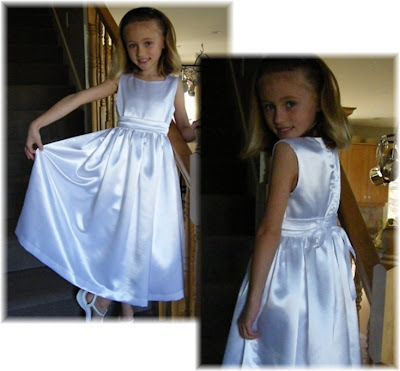 She loves the soft silky feel of the satin and how the lining made the dress feel poofy. She loved the Cinderella sash and the long ribbon on it too. awesome dress and great day for Emily! That's a beautiful dress on her. Congrats!